Food Blogga: What do Hello Kitty, Plasma TVs, and Broccolini Have in Common? What do Hello Kitty, Plasma TVs, and Broccolini Have in Common? When you hear the word "Japanese," what comes to mind? Sushi? Honda? Anime? Karate? Hello Kitty? The Japanese invented of all them. They also brought us karaoke, the CD player, and the plasma t.v., all of which pale in comparison to their greatest achievement, the invention of broccolini. Broccolini, a cross between broccoli and Chinese kale, was invented by the Sakata Seed Company of Yokohana, Japan. What's so special about broccolini? Everything. Unlike bulky regular broccoli, broccolini has long, slender stems that are graced with delicate bunches of buds. Broccolini's flavor is sweeter than broccoli and has hints of earthy asparagus. 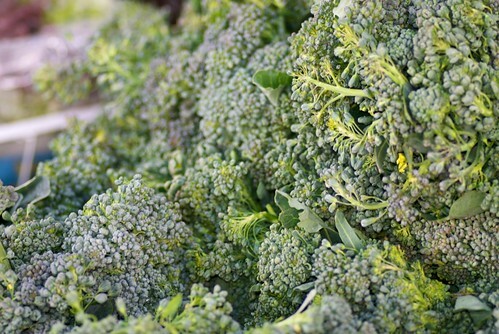 When cooked, it's much more tender than broccoli yet has a satisfying crisp texture when eaten raw. Like broccoli, broccolini can be boiled, steamed, sauteed, roasted, and even grilled. Avoid overcooking it; broccolini prefers a light hand. Since it's so tender, it can be sauteed raw. If, however, you prefer to boil it first, then consider a par-boil. Par-boil broccolini for 1 minute, then plunge it into a bowl of ice water to "shock" it. This will stop the cooking process, maintain its vivid green color, and ensure tenderness. Just drain and pat dry before sauteeing. 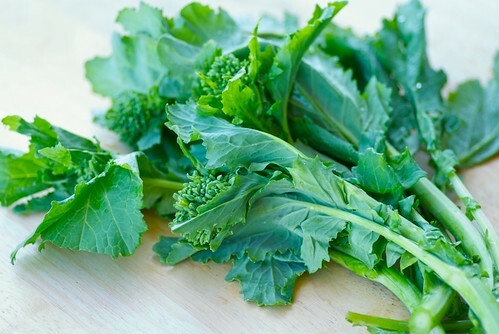 If you're wondering whether or not broccolini is the same as broccoli rabe (rapini), it isn't. Broccoli rabe is a robust Italian vegetable known for its distinctive bitterness. In fact, if you'd like to learn more about broccoli rabe, then check out my latest piece on NPR's Kitchen Window: "You Don't Have To Be Italian To Eat Broccoli Rabe." Now, if the Japanese had invented the iPhone 4, maybe that would be their greatest accomplishment. 1. Cook pasta in salted boiling water until al dente. Note: Fresh pasta cooks very quickly (3-5 minutes), so cook it once the sauce is nearly finished. 2. In a large skillet over medium heat, warm olive oil. Add shallots and saute 3 minutes, or until lightly browned. Add broccolini and saute 2-3 minutes, until just softened and lightly browned. Add white wine and leave alone for 2 minutes, letting the alcohol evaporate. 3. In a small bowl, whisk mascarpone cheese, lemon zest, lemon juice, salt, black pepper, and hot pasta water until smooth and creamy. 4. 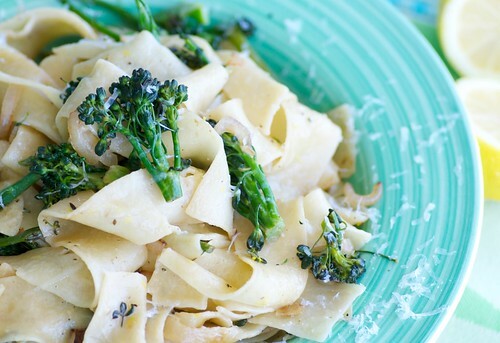 Drain pasta and add to the skillet with the broccolini. Add the cheese sauce, lightly tossing until well coated, about 1 minute. Serve immediately. Top with grated cheese, and, if desired, a drizzle of extra virgin olive oil. Interesting! I've never tried this before. I'll have to look for it at the Hillcrest market when I go next weekend. I never liked broccoli rabe, but do like broccolini, particularly as a weeknight veggies steam and drizzled iwth garlic and oil. I love the idea of incorporating it into pasta. You had me at the mascarpone! I've had broccoli with pasta but the diminutive broccolini would be more appropriate. The colours here are awesome and who doesn't like slurping pappardelle? I had no idea the Japanese invented broccolini! Thanks for adding to our food knowledge. And to think I've actually never cooked with broccolini...I've seen in plenty of times though. I love the sound of this pasta. Mascarpone...pappardelle. Total yum. kirbie-Hope you find it. I love it. ramblingtart-Oh, that's so sweet of you to say. Thanks. peter-"slurping parpadelle." I love that image. joanne-Never? You're missing out. Hope you try it soon! Ok since we just had 3 days of pizzas, I think the pasta will win for tonight. Haha The iPhone will win,no contest. I mean after all the recipe will cut & past into MacGourmet and then the shopping list will appear on the phone in the grocery story. This looks so good! As always, I love your photos. Just tried broccoli rabe last week, and I loved your story on npr. I recently tried broccolini too, in the past few years and also love it, glad to finally know its orgin. Delicious recipes! I'm wondering if they have broccolini at our neighborhood store. I've never seen it there, and don't think I've tried it either, but I'm a roasted broccoli fan so I'm sure I'd like it. great post very interesting. And that pasta looks really good. I never knew broccolini was Japanese! Mmm, thank goodness broccolini hasen't gone the way of the Betamax, or the Minidisc. Delicious recipe and great photos, thanks for sharing. I'll have to try broccoli raab. Anything with marscapone has to be good, right? My kid love broccoli, and I know they'll love those dishes!! that looks super yummy! I've never heard of broccolini before. I need to cook with broccolini more often. Thanks for the reminder. I have yet to try broccolini. Now I need to go hunt some down at the farmer's market. Lovely photos, great information, and another drool-worthy recipe. Thanks! Interesting to know. I didn't the origin of broccolini. I love the flavor though, and your pasta sounds fantastic! I've never heard of Broccolini I have to say, although it looks a little like purple sprouting?